Tim is a self taught photographer beginning at about the age of 16 taking colored slides. Tim married his wife Gen in 1964, they have four children, Scott, Jack, Melinda (Deceased), and Jacob. 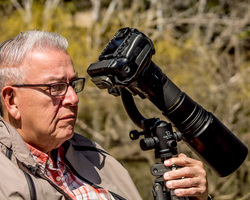 Tim's photo interests are: Landscape, Wildlife, Zoos, Still photos, and Nature. Tim's adventure into the World of Photography began with the Kodak Brownie Star Mite Camera taking family slides. As he advanced, his choice of SLR (Single Lens Reflex) was the Canon Brand / AE-1 Program and (over time) owning several film cameras. Once entering into advanced photography Tim's main goal was to capture the beauty of God's Creation. Several years ago Tim made the move from film into the Digital World of Photography, again (owning several models) and has never looked back. Tim's choice of cameras today remains to be the Canon brand, shooting with the Eos 7 - D.
Tim's interest, goal, and desire of capturing the beauty of God's Creation have taken Tim to such places as: Wisconsin, Illinois, Indiana, Michigan, N Dakota, S Dakota, Wyoming, Montana, Arizona, Utah, N Carolina, Kentucky.